Philippa interviews Michaela Tabb, ‘The Lady Ref’, who has a list of ‘firsts’ longer than any other referee in professional snooker. They discuss the resentment she faced from others at the start of her career, and how she is encouraging other women to get involved in refereeing pool and snooker professionally. 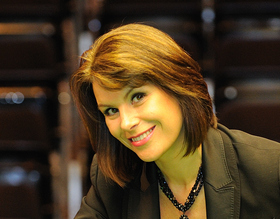 Michaela Tabb was the first woman to referee a professional ranking snooker tournament, as well as the first woman ever to referee a World Championship Final. This year, she will be in charge of her second Crucible Final, and has been joined by another female ref, Zhu Ying, who took some of the first round matches in this year’s competition. This brought about another record – for the first time, two women walked out together in the Crucible to referee matches side by side. I met with Michaela Tabb at the start of this year’s tournament to talk about her 10+ years as a professional snooker referee, working in an almost exclusively male environment and the attentions of her rather devoted fans, as well as how she got through the challenges she has faced and her successes along the way. “World Snooker had always gone to this professional Referees Association to get their refs. They changed that the day that they gave me a contract, and a few others a contract, they basically stuck their two fingers up to them and said we’ll deal with who we want to deal with”. This fasttracking, as well as the fact that she was a woman, led to resentment from certain figures within the game. I ask Michaela whether, when she started, she felt she was not only proving that she could do it, but whether she felt she had to prove that women could do it at all. “I felt as if, when I came into the game, because, there had been other women in the game, there had been other referees, but nobody doing ranking events, nobody at the level I was at, and I felt as if I had the whole women population on my shoulders, that I was sort of trying to carry and go forward”. Michaela no longer experiences any resentment or hostility, having proved herself more than capable, and I ask her how long it took for her to be fully respected as somebody great at her job. “I mean it took a little while, but obviously I have been doing the job for over 10 years now, so it’s the new ones now that they… It’s not that they turn their attentions to, it’s just I’ve earned my place, so no there’s nothing, nothing like that now”. Her passion for the sport is clear, as is her commitment to being the best referee she can possibly be. “It was nice to know that I had a couple of people that had mentored me, and took me under their wing. So when it came time for other females to come through, I felt like it was important to be able to give that back”. The support that Michaela received was so important to her that she knew she had to offer the same to other upcoming referees, and she refuses any suggestion that they are competition to her. Michaela is aware that she has inspired other women to take up refereeing, and feels strongly that this gives her a responsibility to then encourage and support them where she can. In the second part of the interview, to be published tomorrow, I talk to Michaela Tabb about how she feels about the attentions of her fans, whether she is a feminist, and her advice for other women who want to get involved in refereeing cue sports professionally. You can read Part 2 of this interview here. The first image is a photograph of Michaela Tabb. It was taken by Michael Palmer and is used with permission. The second image is a photograph of Micheala Tabb looking at Mark Selby to confirm that the ball is reset correctly during a match in Poland. It was taken by Maciej Jaros and is used under a Creative Commons Licence.